Since the turn of the year Nokia has been busy expanding its range of Windows phone 8 hardware that now includes handsets at a variety of price levels, and now the Nokia Lumia 521 has been officially confirmed but the price is still MIA. We first heard about the Nokia Lumia 521 that was heading to T-Mobile back in February and now the carrier has confirmed the device will be available next month, although the company has yet to reveal the pricing for the device. The handset is the carrier’s version of the Nokia Lumia 520 and could sell unlocked for around $180, and for your money the handset offers entry level access to the WP8 platform that provides users a 4-inch WVGA IPS LCD touchscreen display. This is powered by a dual core Qualcomm Snapdragon processor running at 1GHz that is coupled with 512MB of RAM, and there is 8GB of built in storage that can be expanded further up to 64GB via microSD card. There is also a 5-megapixel rear facing camera, Wi-Fi 802.11 a/b/g/n, Bluetooth 3.0, A-GPS, and a 1,430 mAh battery unit. 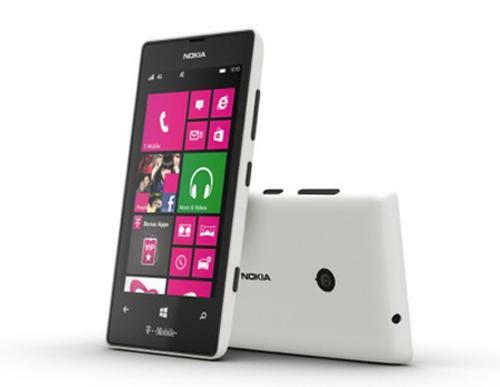 The Nokia Lumia 521 will be available via T-Mobile retail channels, Wal-Mart, and Microsoft Retail Stores. Will you be getting the Nokia Lumia 521?